Looks like the Cash for Clunkers frenzy is dying down, just a few days after the Senate pumped another $2 billion into the program. Consumer interest in the government’s “cash for clunkers” program peaked two days after its official kickoff and has been falling quickly since then, a leading automotive sales tracking firm said today. According to Edmunds.com, interest in the federal program, which pays consumers up to $4,500 to scrap an old car or truck for a new, more fuel-efficient one, hit its highest level July 29. Since then, interest has dropped by 15 percent and could return to pre-launch levels before the end of next week, Edmunds senior analyst Michelle Krebs said in a note accompanying the data. The initial $1 billion pot of money set aside for the federal program was relatively low in relation to the auto market, and this low supply created “a Gold Rush mentality where consumers hurried to take advantage before funding ran out,” according to Michelle Krebs, senior analyst at Edmunds.com, who issued this statement on Edmund’s AutoObserver. 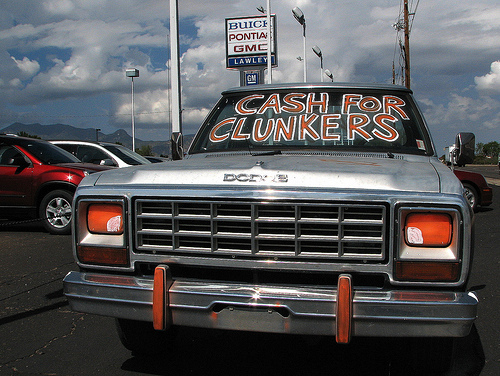 Maybe it’s a good thing that the novelty of Cash for Clunkers has worn off. Earlier this week, EMBARQ founder and senior fellow Lee Schipper (and his colleagues) showed us that the federal program is not only unsustainable in a business sense, but from an environmental stance, too. Read our previous post about why the environmental effects of the CARS program will be negligible. Main points: 1) the program won’t actually do that much to lower carbon dioxide emissions, 2) people will probably end up driving more, and 3) the new cars aren’t that much more fuel efficient than vehicles being sold already.